When Beady Eyes Are Smilin’ | A Daily Dose of Zen Sarcasm! Yesterday the Meowhold™ had a blast being part of the DC St. Patrick’s Day parade (with special thanks to Juanita for making it possible). In short? We had a blast from beginning to end. You know there is always a but. The but, in short, turns out to be that it’s pretty amazing what people –adult, cogent, possibly rational and otherwise grown-up people– will do for cheap plastic trinkets, and how rude they can get. Don’t get me wrong: there were plenty of fun folks who were willing to catch beads and actually thanked us profusely when they got them. They were having fun and hey! Beads! Bonus! (standing a foot away) "MEMEMEMEMEM OH! ME! HERE! BEEEEEEEEEEEEEEEEEEEEEEEADS!!!" (deadpan) "Can I have the green ones?" (gesticulating wildly, without making the effort to catch the beads) OVAH HEAH! LADYYYYYYYY! BEEEEADS!" (jingling a full set of beads) "Can I have some beads?" "Could I trouble you for some beads? (after receiving one set) Seven sets more? (after being handed a silver set) No, green ones! These are for my girls –we’re from Minnes-ooh-ta, y’know?– and THESE ARE THEIR MEMORIES!!!" Really? I was not aware that memories were made in China, and of cheap plastic. I thought that the glee of seeing cars and horses and flags and happy people dancing and smiling and passing by against the magnificent buildings of Downtown DC –especially decorated and festooned for the event as they were– THAT WAS THE MEMORY. After all, I totally didn’t throw the green beads you wanted in your general direction. But seriously? There is nothing more fun than throwing beads at the adoring crowds! 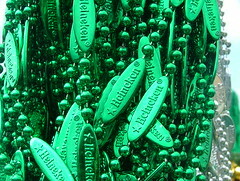 Erin Go Beads, Forever!!!!! 17 Mar	This entry was published on March 17, 2008 at 6:51 pm and is filed under Photoblogging. Bookmark the permalink. Follow any comments here with the RSS feed for this post. Newer: Reject: “Loud Burper” Is Just Two Words. That is crazy but people are becoming more and more crazy these days. At least I know my psychology degree was a good choice lol Have a great day!! OMG you got to throw beads in the parade?!?! WOW that’s so totally cool! I’m so damn jealous!